Lest my faithful readers imagine I've become waaaaay too serious of late, I'd like to recommend a series of mystery novels. Carrie Bebris has written a series of very entertaining mystery novels based on characters from Jane Austen novels. Ms. Austen may not have known it, but Mr. and Mrs. Darcy were in for some adventures and fun after she got done with them. At any rate, prepare yourself for the titles. Pride and Prescience. Suspense and Sensibility. North by Northanger. I've devoured all three in less than two weeks, and it's just the sort of break my tired brain has been craving. The first two center around supernatural events that kind of annoy me, but they were still fun. 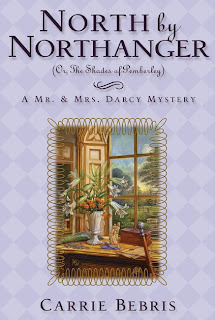 My favorite by far is North by Northanger, maybe because that's the bit of Austen I've read most recently. It's getting to be the time of year for a nice cup of tea and a good book of an evening. And what with the writers' strike and all, go ahead and turn off the TV so you don't accidentally cross any picket lines. * Happy reading!! Austen's work is all in the public domain which means that adaptations etc. are all fair game. Thanks to lobbying efforts by the likes of Disney and other media conglomerations, the stuff for which the currently striking writers would like to get paid will pretty much never hit the public domain. Copyright law is so much more exciting than one might otherwise imagine. So, to recap, one could argue that the writers' evil overlords have managed to secure exclusive rights to profit from their work in perpetuity. I'd strike too.